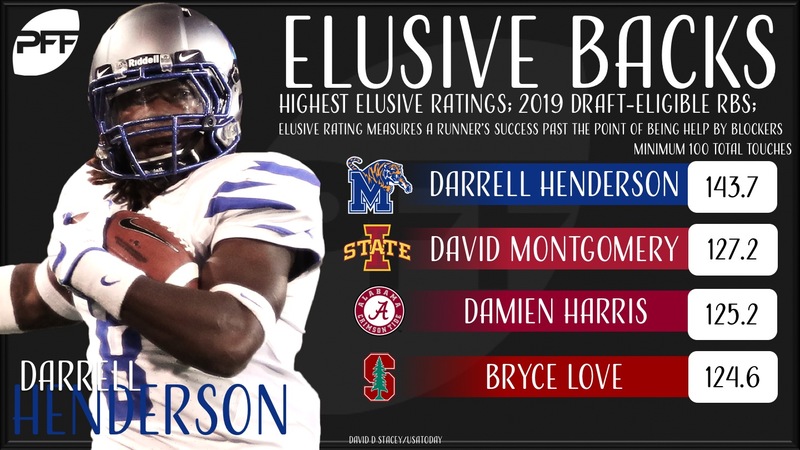 Earlier this week, we examined the 2019 NFL Draft class at wide receiver and those who stood out on deep passes a season ago. The draft class has its standouts at receiver, that is for sure. This draft class also full of talented running backs both on the ground and through the air, and potentially a few who can do both extremely well. There were plenty of multi-faceted running backs selected in the 2018 NFL Draft but they all seemed to trail No. 2 overall selection Saquon Barkley, who excelled catching passes out of the backfield. Barkley’s selection at No. 2 overall signified the changeover to a specific type of running back in today’s pass-happy NFL in which passing the ball has been proven to be more valuable than running. Running backs who can do both, and do both well, will continue to bring value to their respective franchises in the future. *Reminder: these are just players who are eligible for the 2019 NFL Draft, have data from the 2017 season and are returning to the FBS in 2018. One of the go-to statistics in the PFF social community, missed tackles forced by players are pretty straightforward. Did the player make a move that forced who would have been a sure tackler on the play to miss? If so, chalk it up as a missed tackle. That being said, there are two ways a running back can make defenders miss, on carries and after receptions, and we’ve broken them down as such. 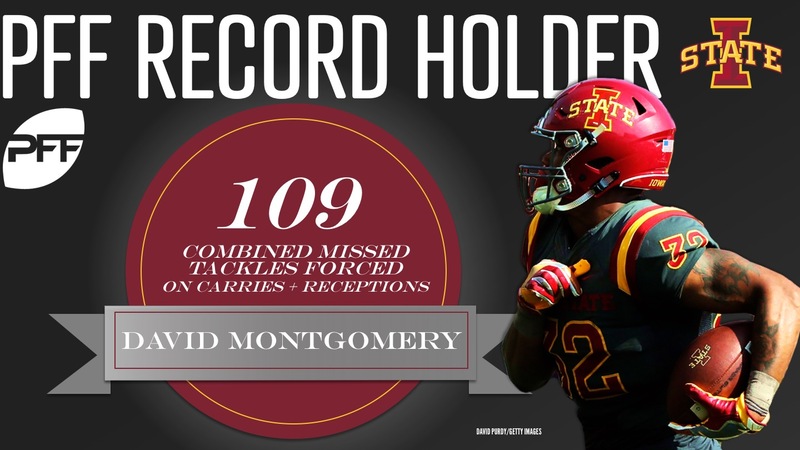 This list begins and ends with David Montgomery. The Iowa State standout broke the PFF College record for most combined missed tackles forced in a season at 109 (previous record was 98), thanks in large part to his 86 missed tackles forced on just 258 attempts. Montgomery routinely made defenders miss and even averaged 3.43 yards after contact per attempt proving he was not just a one-trick pony but rather, incredibly tough to tackle regardless of whether he was going to run you over or run around you. Lesser known Devin Singletary from FAU checks in at No. 2 on this list, just narrowly behind Montgomery with 83 missed tackles forced on carries. Singletary also cracked the list of all-time great performances with his 93 total missed tackles forced, or fifth-best in the PFF College era. He however needed nearly 300 carries (299 to be exact) in order to do such a thing, seeing the decrease in his elusive rating (more on that later). 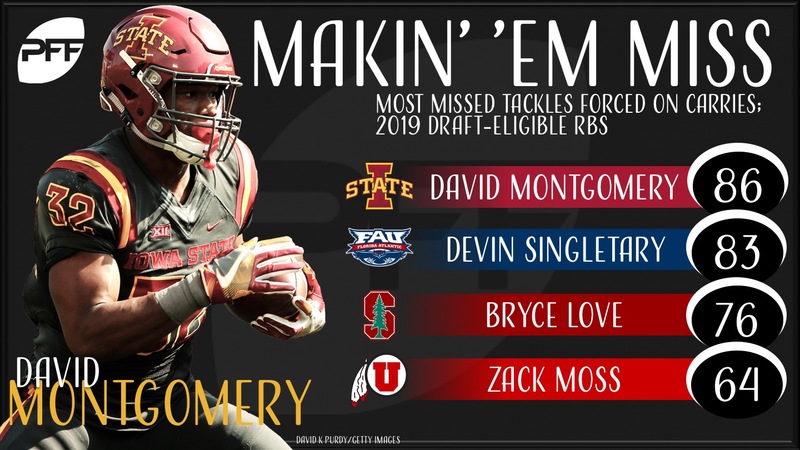 Rounding out the list is Heisman finalist Bryce Love (76), Utah’s Zack Moss (64) and Oklahoma State’s Justice Hill (50) as the only 2019 draft-eligible running backs returning this fall with at least 50 missed tackles forced off carries. Another player of note, rising junior running back Benny Snell Jr. of Kentucky forced 44 missed tackles a season ago, marking the second consecutive year he has forced exactly 44 missed tackles on carries. Will he repeat, or even vault his average in his third season at Kentucky? Another list that Montgomery belongs to the top portion of, if we were going off forced missed tackle rate on receptions, he’d belong at the very top. 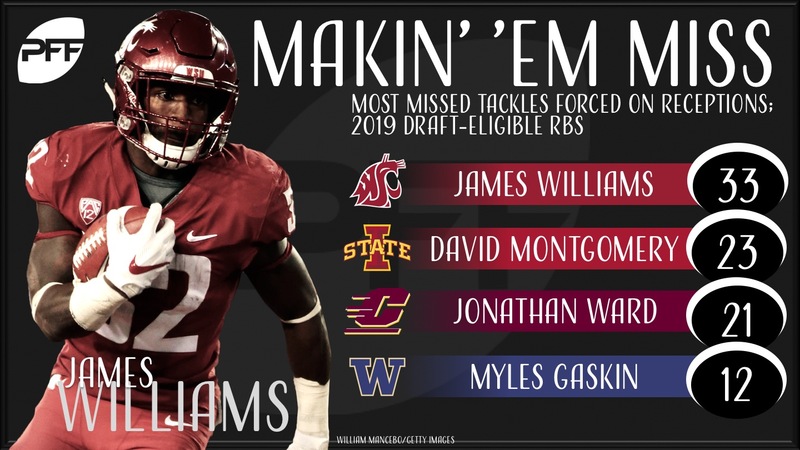 However, due to the Air Raid scheme at Washington State, James Williams returns having forced a whopping 33 missed tackles after the catch last year. He did so on 71 receptions while Montgomery forced 23 on just 36 receptions. Central Michigan running back Jonathan Ward also saw a high volume of targets as he hauled in 51 receptions and forced 21 missed tackles after the catch to check in at No. 3 on this list. Sure it’s one thing to have a gaudy amount of missed tackles forced, but it’s always going to beg the question “well how many more carries did he have than (insert your favorite player who you think should be on the top of any list here)?” This is where PFF’s elusive rating comes in handy. Elusive rating takes into account essentially how many missed tackles forced a player had, in comparison to how many total touches they had over the course of a season (along with other factors including yards after contact, no need to get too technical) to come up with a figure that stands the test of how many touches did it take a player to record their total missed tackles forced. With that in mind (and a minimum total touches of 100 combined carries and receptions), Memphis RB Darrell Henderson comes out on top with his 143.7 elusive rating, forcing 39 combined missed tackles on just 152 touches. Montgomery again finds himself near the leaderboard with a 127.2, having forced his record 109 missed tackles on 294 total touches. Big plays come in chunks and those chunk-plays can shift momentum in the offense’s favor at a moment. Just watch any Bryce Love big gain last season and you’ll see the entire Stanford team leap from the sidelines. PFF classifies these big gains on the ground as breakaway runs, or any run that gains 15 or more yards. Speaking of Love, he had 35 such breakaway runs last season, second only to Singletary, however, on his 35 breakaway runs, he accumulated 1,405 of his total 2,119 yards. 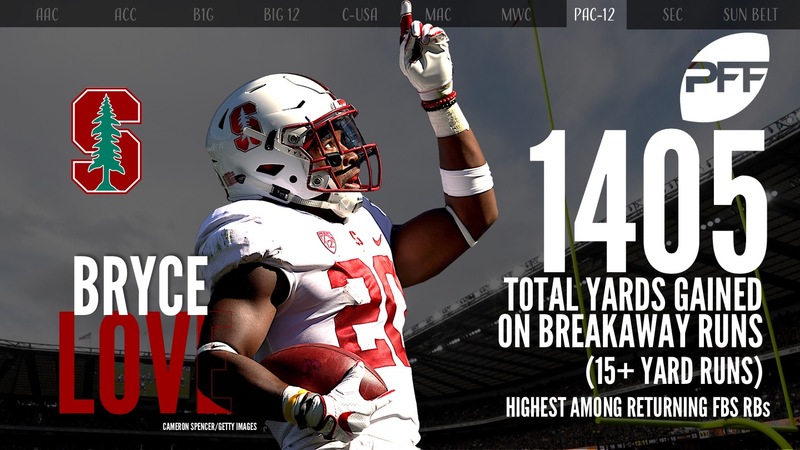 His 1,405 breakaway yards were nearly 500 more than the next closest (Singletary, 917) and his breakaway percentage (percentage of yards gained on breakaway runs) of 66.3 percent was exactly 6.0 percentage points above the next running back. Sure you may want a running back who gets you 3-4 yards every carry, but a player who can gain you 1,405 yards on just 35 plays is out of sight. Only two other running backs in the 2019 NFL Draft class ran for more than 1,405 yards total last season. Every running back is expected to spend some time running routes in the pass game across the course of a season. Some do it more often than others be it because of scheme, ability or some combination of both. So how do we decipher which running backs were real threats in the passing game and others who ran snaps in route on every passing down, seeing an influx in targets and receptions in exchange? PFF’s yards per route run metric does more than just account for how many times a receiver ran a passing route. It calculates how many snaps a running back ran a pass pattern as a viable target and averages out how many receiving yards he accumulated, giving us a standalone figure that showcases how useful each player was on a per-route basis in the passing game. Last year, the aforementioned Saquon Barkley ran away with the lead among draft class running backs with at least 165 snaps in route and this season, the race is open to be No. 1. Dropping the minimum snaps in route to 100, Miami (Oh.) 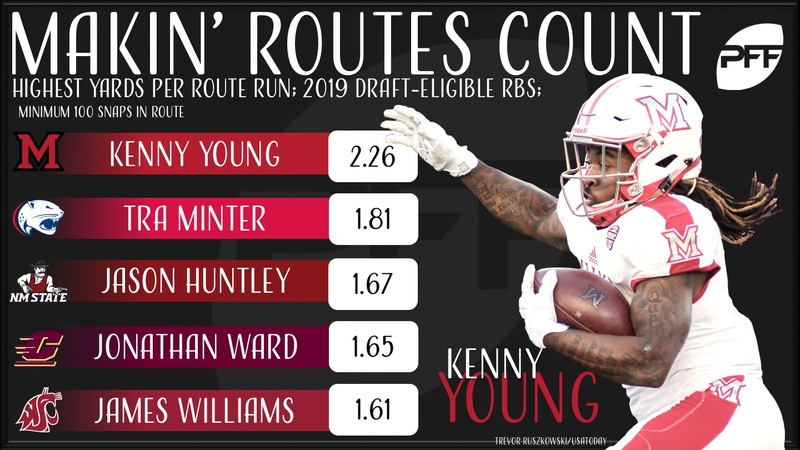 RB Kenny Young stands out, having averaged 2.26 yards per route he ran a season ago. Oklahoma RB Rodney Anderson made the most of not only his snaps in route but also his receptions as he was the only RB with at least 100 pass patterns run and less than 29 receptions to average a yards per route run figure over 1.53. His 1.59 YPRR is good enough for sixth-best among returning 2019 NFL Draft RBs as he also found himself on the list of breakaway yards despite sharing carries in the Sooner backfield.